Photo : GRAND CHAMPION BESTEN CAPED CRUISADER WINNING BEST IN SHOW AT THE NSW UTILITY DOG CLUB CHAMPIONSHIP SHOW ,SEP,2003. Ever since I was 13 years old I had always wanted a mini schnauzer as their comic looks and fun loving character appealed to me.Also, being an allergy sufferer I needed a dog that did not shed and this breed suited my needs.I began with my first show dog in 1986 from Marelyne Mc Leod Woodhouse of Schonhardt kennels fame and as they say the rest is history. After successfully exhibiting a large number of Schonhardt dogs , to their championship titles, I wanted to show and breed in my own prefix. I chose the name "Besten" as it translates from German to mean Best and to breed the best miniatures that I could became my mission. Over the years that followed I bred a number of successful salt and pepper champions and had always desired to breed beautiful blacks.This dream came true when Marelyne imported the outstanding stud dog Aust.Can Ch. Minuteman To the Batmobile ( Imp Can) "Robin".Who is a multiple Best In Show winner and has an amazing attitude, schnauzer type and shape ,correct scissor bite,harsh coat,intense colour and driving movement.These are all traits that are evident in his offspring.Thanks so very much to Catherine McMillan (Canada) for allowing Robin to come to Australia he certainly has made his mark. Ch Besten Poison Ivy(salt and pepper) and Grand Ch. Besten Caped Cruisader"Cruise"(black). I am currently campaigning Cruise and Ch Besten Shes So Vain who is a daughter of Ch Besten Poison Ivy. Cruise is an amazing show dog and he continues to make an impact on the show ring and on my heart!He has now beaten his father's achievements and made breed history to become Australia's top winning black miniature. 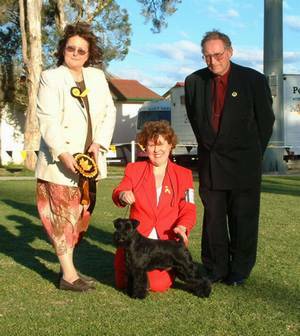 Update: "Cruise" wins BEST IN SHOW at The Schnauzer Club of NSW Specialty Show,October,2004!